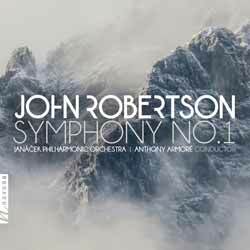 John Robertson's Symphony No.1 is a beautifully moving collection of pieces that trawls the back history of classical music for its inspiration. The first movement, 'Symphony No 1 Op 18', starts out touching upon 20th-century harmonies reminiscent of Prokofiev, while the second harkens back to the late Romantic school. 'Suite for Orchestra Op 46' opens with the stirring 'Fanfare', before moving onto one of my favourite segments of the album, 'Waltz', which starts slowly before blooming into a wonderfully memorable piece. 'Elergy', from this work, is another highlight. 'Variations for Small Orchestra, Op. 14, explores the possibilities of thematic development from every imaginable angle, ranging from the solidly-classical to the breezingly and self-confidently outlandish. The three pieces are spread over 11 tracks (1 hr, 17 min, 03 sec) and together make for a memorable emotional roller coaster. From time to time you'll witness a note or two from Elgar another from Prokofiev and the occasional inspiration from composers like Holst. Robertson's compositions are heartbreakingly beautiful and wonderfully timeless.